Towpath Trail - - - There are 41 miles of the multipurpose Ohio & Erie Canal Towpath Trail in Summit County. 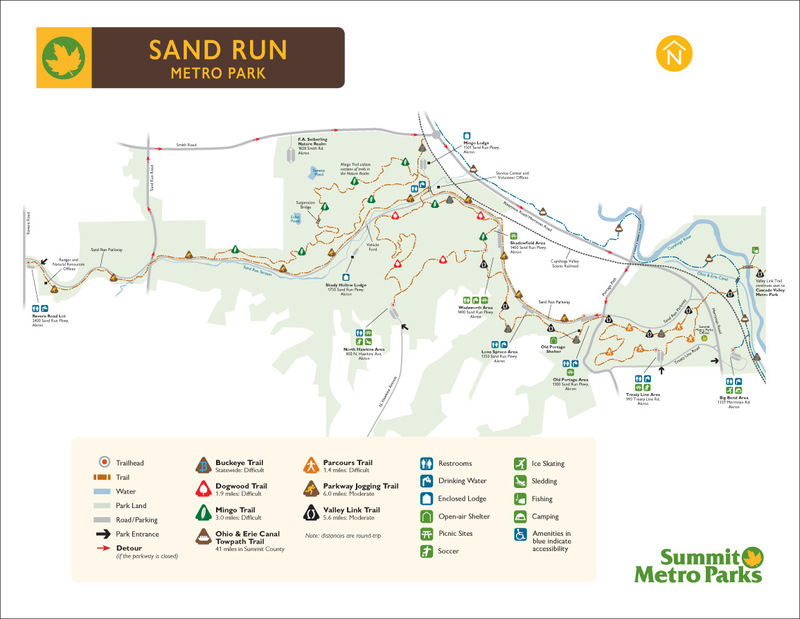 Summit Metro Parks manages half of that distance, from the southern boundary of Cuyahoga Valley National Park to the Stark County line, except about three miles in Akron. Address 1350 Sand Run Pkwy. Address 800 N. Hawkins Ave. Address 1300 Sand Run Pkwy. Jogging Trail 6.0 B,C 2 The Jogging Trail is the most popular in the park district. It is plowed in winter to allow access year-round. At the start of the trail, from the Old Portage Area, a one-mile (round trip) section earns Class B status and is good for users with wheelchairs, walkers, canes and strollers. Address 2400 Sand Run Pkwy. Address 995 Treaty Line Rd. Parcours Trail 1.4 C 3 If you're looking for something other than a casual hike, challenge yourself on this trail with 20 numbered exercise stations. Each has a beginner and "par" level indicated on its sign. Trailside markers direct users to either walk or run at different intervals to enhance the workout. Address 1400 Sand Run Pkwy. Dogwood Trail 1.9 C 3 Explore shady valley and ridge-top terrain along the wooded and challenging Dogwood Trail. Climb the hill to the North Hawkins Area sled hill before descending back to the Sand Run valley. Mingo Trail 3.0 C,D 3 The wooded Mingo Trail harbors a variety of wildlife and oak, beech and tulip trees. The trail becomes quite rugged, earning Class D status. The 998-acre Sand Run Metro Park opened in 1929, but the area has been welcoming visitors for centuries. The land surrounding Mingo Pavilion was a campsite for Mingo Indians. Portage Path was once an important Native American trail between the Cuyahoga and Tuscarawas rivers; later, it was the western boundary of the United States. A high ridge above the Wadsworth Area was a lookout point for General Elijah Wadsworth, who made his camp near the present-day Old Portage Area during the War of 1812. In the 1930s, Sand Run Parkway and many of the surrounding shelters and structures were constructed by the Civilian Conservation Corps. In 1974, the park district's Administrative Offices were moved from Goodyear Heights Metro Park to Sand Run. Today, visitors can drive through the Sand Run stream at the ford which crosses Sand Run Parkway. In the cool, shady ravines of Sand Run and its tributary streams, hemlocks, ferns, skunk cabbage and large colonies of horsetails grow. Each spring, large-flowered trilliums and other seasonal blooms appear, including foam flower, bloodroot, spring beauty and trout lily. The towering forest is home to red, gray and fox squirrels; screech, barred and great horned owls; and pileated woodpeckers. Red-tailed hawks roost in the treetops when they are not soaring over the ridges. Many rare species inhabit the park, including sharp-shinned hawks, butternut trees and native orchids. A small wetland near Sand Run Parkway and Merriman Road is a popular attraction for many nature enthusiasts, as it is the location of a highly productive amphibian breeding area. Each spring, the parkway is closed on nights when spotted salamanders and other amphibians migrate for mating. 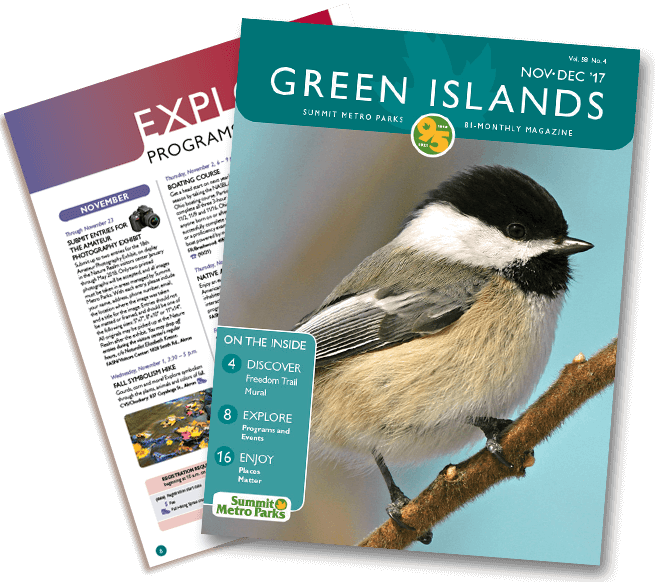 Visitors may watch hundreds of amphibians such as spotted salamanders, spring peepers, wood frogs, American toads and green frogs crossing the road to mate.